There is always hope. To lose hope is to give up. I sometimes attend Mass in other churches, to see what is or isn't happening around the country, and I can see that attending Mass can be a dismal experience for some people: you see it on their faces as they leave the church. But you don’t have to wait that long: you know from the empty homilies, the disconnection, the lack of preparation, the untrained readers…. I heard a priest describe another priest as “a great man to empty a church.” He was referring to his preaching, and to what someone called his ‘sanctuary skills’. That young priest in your parish has many years of priesthood before him, probably, but he may not have so many years with a congregation. The hope is that sooner or later he will come to see the gifts of the Holy Spirit in today’s laypeople. It must be quite perplexing to be a young priest today. They were born into a turbulent Church that is trying to find its way in a turbulent world. Had that Church chosen to stay out of the flood, it would still be standing on the bank, pronouncing anathemas. Instead it has chosen to dive in, to “live among us,” like Jesus himself. You can be perfectly costumed as you stand on the bank, but once you dive in, you are in the actual world, which is a messy place. Some (happily, not all) react to this by clinging to a rigid identity – ill-fitting on any young person. Before the 1960s, the Church had been changeless for generations; in religious life and in seminaries everything was set in concrete; there was a rigidity about Liturgy and religious rules and practices. Against that background, a little freedom seemed to us like the breath of life. But the later generations have grown up in a world of dizzying change, even chaos; so I can see the attraction that a measure of fixity holds for them. Some go further and want to recover the rigidity of an earlier age, even reintroducing obsolete rubrics in the Liturgy. I doubt that any of them would be willing or able to endure that older regime if it were suddenly restored in full. For one thing, obedience was the key virtue in those days, but I don’t see any striking examples of it in the new generation. Poverty and simplicity of life would be another point of contrast. The new style, I think, does not show a greater fidelity to tradition but a fear of experience and a preoccupation with self-identity. You are unlucky in your parish, but of course it isn't like that everywhere. I have often been inspired and encouraged in the Masses I have attended. Why don’t you shop around? You are not a prisoner of your parish. But I'm going to suggest a way of being present at Mass that doesn’t depend on a humble and unaffected celebrant or a talented team in the sanctuary. I'll come to this in a roundabout way. One of the most beautiful churches I have ever seen is in Perth. 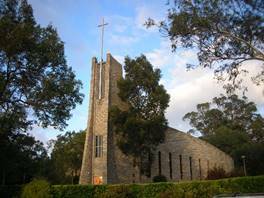 It is often described as the most beautiful church in the southern hemisphere. The architect was an Irish Dominican, Fr Bonaventure Leahy; and years before I got to see the church I used to hear him talking about it. He had put his heart and soul into it: the very shape of the church was a gesture of prayer, and this was true of every detail as well. “The reason why each detail is the way it is,” he used to say, “is that God is God.” When you sat (even alone) in that church you felt ‘carried’, somehow, and you felt no inclination to leave. It makes sense that a church should be beautiful, because “God is God.” But God is not bounded by place. Meister Eckhart spoke of finding God even “by the fireside or in the stable.” It is a bonus if a church is beautiful. It is a bonus if a Liturgy is beautiful. But not all churches are beautiful. Not all Liturgies are inspiring. What do we do when a Liturgy is not beautiful, or inspiring… or when it is downright annoying? Here is a suggestion. Even in the case of a very ugly church and an uninspiring Liturgy, everything is the way it is because God is God. It doesn’t do God justice, obviously; and neither does it do us justice. But, just as truly as that one in Perth, every church stands there for no other reason than that God is God. The readings, even if we can't hear them, are such because the Word became flesh. You are sitting in these benches for no other reason than that you believe Jesus to be present. None of these things or actions make any other sense. They serve no mundane purpose whatsoever. If you go to church because of the beautiful architecture or the wonderful music, you are not yet going down to the full depth of their meaning. If the words of the homily annoy you, pick out one, and stay with it – the word ‘hope’, for example, or even just the word ‘good’. St Bonaventure, the great Franciscan theologian of the 13th century, used to breathe the simplest prayer, over and over: ‘o bonitas!’ – “Oh goodness,” because for him that was the ultimate name of God. Listen to the words of Consecration: “my body… given for you; my blood poured out for you.” Stay with them, breathe them over and over. When something strikes into your heart, it becomes an entire world in itself. Younger people are less likely to have the patience for this, because they are more tuned to spectacle and performance. Your sons and daughters will think you are mad if you tell them that when all else fails at Mass you just rub your finger on the bench in front of you and say to yourself, “This bench is here because God is God, and for no other reason. When I touch it, knowing this, I am experiencing the meaning of the Incarnation.” The Word became flesh in order to live among us. He even became a carpenter, for God's sake! Touching that wood is touching the whole mystery. When you dip the tip of your finger in the ocean, you know the taste of all the oceans of the world. I once heard a radio conversation between two French novelists. When asked where they would most love to go, one of them said he would love to travel the whole world and relish every square metre of it; the other said he would rather stay on one spot and sink deeper and deeper into the earth. Beautiful Liturgies take us on a beautiful journey; the others force us into depth. I hope this may be of some help to you, Eithne.